MICE Detector Systems · Beam Monitors u u u · The noise problem has been reproduced in the test lab at Fermilab and a retrofit RF noise suppression kit has been sent to Craig Macwaters. The small (upstream) BM has been removed and Craig is working on it. Once the shielding fixes have been installed, the small BM should be returned to the MICE hall and studied to see if the noise problem has been eliminated. We are rebuilding the fiber planes for both the small and large counters. The new fiber planes will be a doublet structure instead of a singlet structure and will use blue emitting scintillating fiber instead of the green emitting (3 HF) that was used in the current planes. This should give approximately a factor of 5 increase in signal/mip. All parts are in house and the fiber layup has begun. New planes should be shipped to RAL the first week of October. 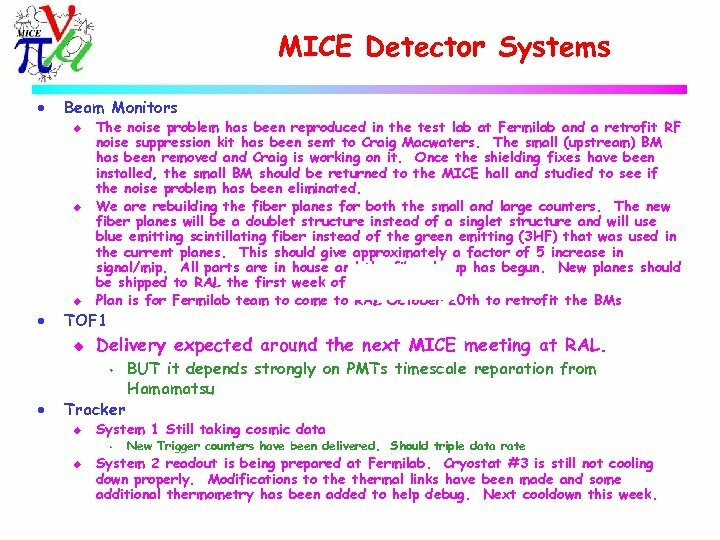 Plan is for Fermilab team to come to RAL October 20 th to retrofit the BMs TOF 1 u Delivery expected around the next MICE meeting at RAL. 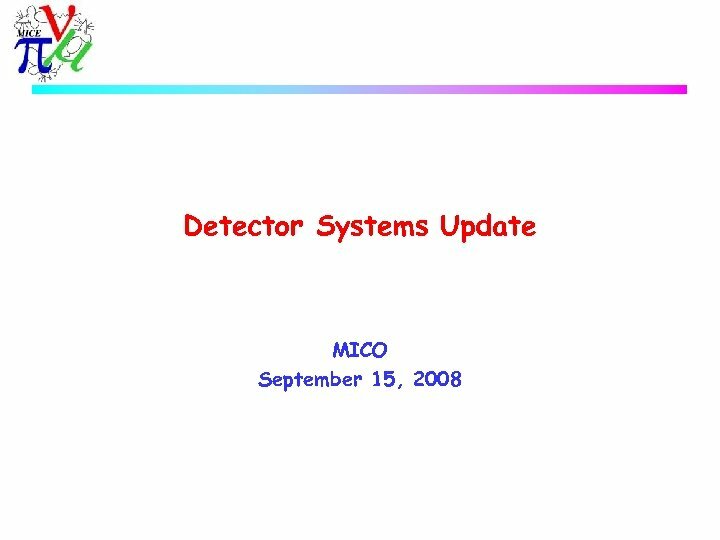 s · Tracker u System 1 Still taking cosmic data s u BUT it depends strongly on PMTs timescale reparation from Hamamatsu New Trigger counters have been delivered. Should triple data rate System 2 readout is being prepared at Fermilab. Cryostat #3 is still not cooling down properly. Modifications to thermal links have been made and some additional thermometry has been added to help debug. Next cooldown this week.